Agyei on the Biography Channel reflecting on the conspiracy to flood Harlem with drugs in the 1980s. 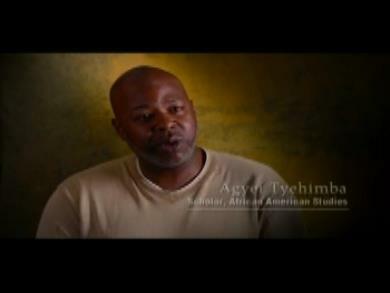 Agyei is the Founder and Director of Harlem Liberation School and Black Liberation University YouTube Channel. Please subscribe! Mr. Tyehimba is a professional consultant and public speaker providing political advice and direction for Black college student organizations, community activist groups, and nonprofit organizations. If you are interested in bringing Agyei to speak or provide consultation for your organization, please contact him at truself143@gmail.com. What do you think about freemasonry? It has good and bad attributes in my opinion. The good attributes, in my opinion, are transmission of civilization through education. Education can be formal or institutional (academic), vocation (commerce or public sector, or personal (cultural and societal values and beliefs, family values). Nation building. Many African Americans always reminisce of the days when Africans ruled strong empires. The truth is that is not the current reality. African American need to REMEMBER how to be nation builders again which means they must become independent. Are we growing are own food, piping our own water, building our own homes, teaching our children, governing our neighborhoods, etc. People are always slaves, the only question is who is your master. It could be another person, or it could be hard work, responsibility, self-reliance, continuous improvement, etc. The latter is when one becomes independent and no other man is his master. His only master is the effort he must exert to protect and preserve existence, society. Life, liberty, and the pursuit of happiness are conditional and the key. We must study it if we truly wish to be independent. The evil which can attach itself to freemasonry, and has in the past is the human condition. There is not correlation between intelligence and morality. There are some people that are independent and good, as well as independent and bad. That’s part of the baggage of maintaining society. Teaching people how to maintain institutions gives them power, but they may abuse it. Also, they use race, not because they are racist, but because it is a tool and security measure. The instant formal government breaks down, society begins to act. A general association takes place and common interest produces common security.